Hand made in Italy. I waited 5 weeks, you won’t have to wait. Many ways to adjust to fit many horses. 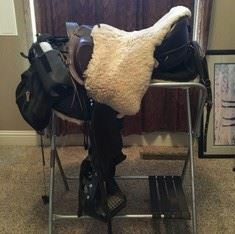 6 rides total on this saddle. I will pay $35 towards shipping. I will also sell Ghost Medicinal Sheepskin Saddle Pad made for this saddle for $125. Accessories shown in first pic not included. Located in Reno, NV. Sold!